Are you looking for the best winter holiday cheesecake recipe? This is it! While the crust does require a short baking time, otherwise this cheesecake whips up quickly without monopolizing the oven on Christmas Day, or heating up the house (just in case you decide you can't live without it come July). 😉 It's light, yet rich and satisfying, with an easy chocolate ganache topping. Whether snow-lined window panes or hot sunshine, this dessert brings year-round bliss! 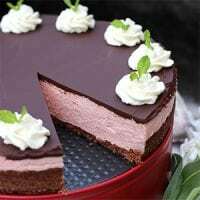 Organic beet powder lends this cheesecake its pretty pink color. If you'd prefer, leave the filling white, or try out nutrient-dense spirulina for green! Need the perfect winter or holiday dessert? 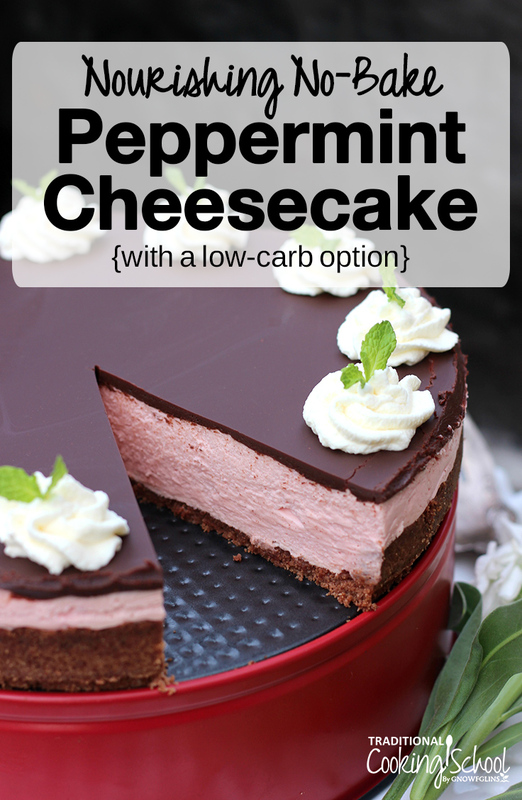 This Nourishing No-Bake Peppermint Cheesecake with chocolate ganache is IT! Allergy-friendly and low-carb, too! Melt lard or fat of choice in small saucepan, then remove pan from heat. Add remaining ingredients, stirring well to combine. Press crust into cheesecake pan, going up about 1 inch on the sides. Bake crust 10 minutes. Set aside to cool while you make the filling. Place 1/4 cup water in small saucepan. Sprinkle 2 teaspoons gelatin over surface and allow to bloom for 1 minute. Stir in gelatin and turn heat to medium. Stir gelatin until it melts and there is foam on the surface, about 1 to 2 minutes. Stir in maple syrup, optional beet powder (or spirulina), peppermint oil, and stevia. Don't worry if the beet powder clumps. Set aside. The mixture will congeal a bit. In large bowl, beat cream cheese until smooth and slightly fluffy, about 30 seconds. Add sweetened gelatin mixture, one large spoonful at a time, fully incorporating the mixture as it’s beaten in. Continue until all the sweet gelatin is added. Fold the plain, room temperature whipped cream into the sweetened gelatin cream cheese mixture with a rubber spatula. Pour this filling into the cooled crust, smoothing out the surface. Place 1 tablespoon water in small saucepan. Sprinkle 1/2 teaspoon gelatin over its surface and allow to bloom for 1 minute. Once bloomed, stir in gelatin, then keep stirring constantly over medium heat. The gelatin will dissolve in about 30 seconds. Whip 1 cup cream until soft peaks form. Refrigerate. This will become the topping later on. When the cheesecake is set and you're ready to assemble, gently melt lard over low heat in small saucepan. Remove from heat. Be sure no water comes in contact with the lard or inside of the pot. Add cocoa powder and maple syrup. Stir well, until thoroughly mixed. Set aside to cool. Remove cheesecake from the fridge. Pour cooled chocolate topping over its surface, spreading out evenly to the edges of the pan. Remove the cheesecake and reserved whipped cream from fridge. Place the whipped cream into piping bag, preferably fitted with a large, pretty, star tip. Pipe whipped cream around the circumference of the cheesecake decoratively. You will have some leftover -- use for topping festive hot chocolate! To garnish, add fresh mint. Refrigerate 6 hours or overnight. Serve and enjoy! Looking for more nourishing, gut-healing, sugar-free foods that your family will love to eat? Be sure to check my cookbook: Eat Beautiful: Grain-Free, Sugar-Free and Loving It (softcover version as well). It contains all the recipes I've perfected through my family's years on a gut-healing diet. My eBook and video package is currently 50% off. One of the bonus videos you'll get explains the grain-free baking technique I use to make amazing panini sandwiches for our gut-healing cafe in Eugene, Oregon! And there are lots of yummy, refined sugar-free dessert recipes! 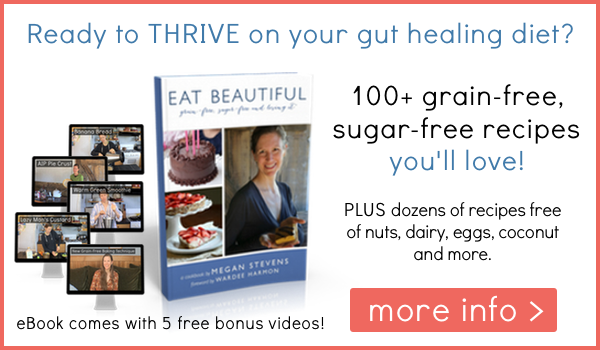 Click here for more info or to buy my book, Eat Beautiful: Grain-Free, Sugar-Free and Loving It for 50% off (plus get 5 bonus videos). Love no-bake holiday cheesecakes? Here’s another special one: No-Bake Eggnog Cheesecake! Looks beautiful and tasty. Please, what size cake pan to you recommend? Unable to eat almond flour what would be a good substitute? Thank you for your help. what is sustainably-sourced gelatin? can we use another ingredient instead it? I think we need lots of time for making this delicious recipe. Thank you for sharing this interesting and sweet recipe. looks really so beautiful. I want to taste it. I making this delicious cake, surely. Thank you for sharing this recipe. What is the difference between the heavy cream listed in the cheesecake filling and the pastured cream in the whipped cream topping. Are they the same thing? Thanks. No where do I find the size of cheese cake pan. I have 3 and I don’t think any of them will work. One is to big, and the other two are two small. So what size should I use for this recipe. What a wonderful collection of romantic menu ideas! Perfect for Valentine’s Day menu planning!